For centuries, the Taj Mahal has inspired poets, painters and musicians to try and capture its elusive magic in word, colour and song. It is one of the most flawless architectural creations of the world.Since the 17th century, travellers have crossed continents to come and see this ultimate memorial to love, and few have been unmoved by its incomparable beauty. 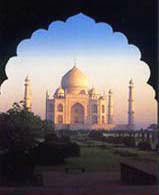 Taj Mahal stands in the city of Agra, in the northern Indian state of Uttar Pradesh, on the banks of the Yamuna River. 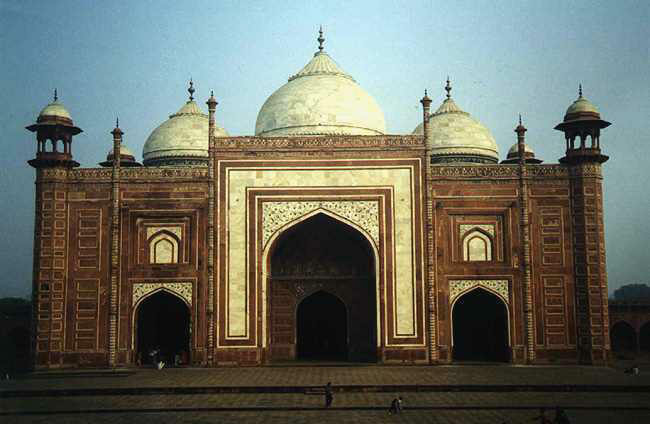 It was built in the memory of the beautiful Arjumand Bano Begum, who won the heart of a Mughal prince. She was married at 21 to Emperor Jahangir's third son Prince Khurram and stayed loyally by his side through good times and bad; in the luxurious royal palaces of Agra as well as the transient tents of war camps. In AD 1628, Khurram became king after a bloody battle of succession: he took the name Shahjahan or King of the World and Showered his beloved begum with the highest titles. She became Mumtaz Mahal, the exalted of the palace and Mumtaz-ul-Zamani, the exalted of the Age. But Mumtaz Mahal was not destined to be queen for long. 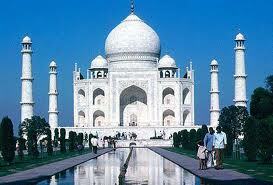 In 1631, Shahjahan went on an expedition to the south and, as always, Mumtaz Mahal accompanied him. But she died in childbirth at Burhanpur. Shahjahan had fourteen children, of whom four sons and three daughters survived. When Mumtaz Mahal died, she was just 39 years old. Shahjahan was inconsolable and contemporary chronicles tell that there should be a royal court mourning for two years.There was no music, no feasting, and no celebration of any kind. Shahjahan, who was a passionate builder, now decided to erect a memorial for his queen in pristine marble that the world would never forget. The site selected for the tomb was a garden by the Yamuna river, unshadowed by any other structure. The garden had been laid by Raja Man Singh of Amber and now belonged to his grandson, Raja Jai Singh. By a royal Firman, Shahjahan gave Jai Singh four Havelis in exchange for the garden. The site was also chosen because it was located on a bend in the river, and so could be seen from Shahjahan's personal palace in Agra Fort, further upstream. Work on the mausoleum began in 1633 and 20,000 workers laboured for 17 years to build it. The most skilled architects, inlay craftsmen, calligraphers, stone-carvers and masons came from all across Indian and lands as distant as Persia and Turkey. The master mason was from Baghdad, an expert in building the double dome from Persia, and an inlay specialist from Delhi. Yemen sent agates, the corals came from Arabia, the garnets from Bundelkhand, onyx and amethyst from Persia. Mumtaz Mahal's final resting-place was ornamented like a queen's jewel-box. The glory of the monument is strangely undiminished by the crowd of tourists who visit each day, as small and insignificant as ants in the face of this immense and captivating monument. That said, the Taj is at its most alluring in the relative quiet of early morning, shrouded in mists and bathed with a soft red glow. As its vast marble surfaces fall into shadow or reflect the sun, its colour changes, from soft grey and yellow to pearly cream and dazzling white; it's well worth visiting at different times. This play of light is an important decorative device, symbolically implying the presence of Allah, who is never represented in anthropomorphic form. The Taj Mahal shows a different aspect of beauty at different times of the day. The sight of the Taj awash with the subtle pinks of dawn is an unforgettable sight. Sunsets stain the Taj an exotic shade of orange. But nothing beats the poignant beauty of the Taj seen when the cool white marble is bathed in the soft silver light of the moon. Even in the bright light of the day, this wonder of the world shines with an awe-inspiring loveliness. There's no time limit on visits to the Taj, and some people spend most of the day here, sitting, reading, dozing or picnicking in the beautifully kept gardens. Hawkers and salesmen are not allowed in, and official guides are not available on site, but can usually be provided by hotels, and always accompany organized tours. The ticket office, just outside the western gate, is rarely blocked by long queues, except between 4:00 to 5:00 pm before the admission fee increases; bring the right amount of money as the ticket booth attendants rarely have change and tend to pocket the difference. Taj Mahal changes its moods with the seasons and the different times of the day. At dawn, the marble has a delicate bloom in shell pink, by noon it glitters majestically white, turning to a soft pearl grey at dusk. On full-moon nights, the silver light makes it float away against the star-spangled sky. Monsoon clouds give it a moody blue tint and it appears and disappears like a mirage in the drifting mists of winter. It can be solid and earthbound, fragile and ethereal, white, amber, grey and gold. The many faces of Taj Mahal display the seductive power of architecture at its best. 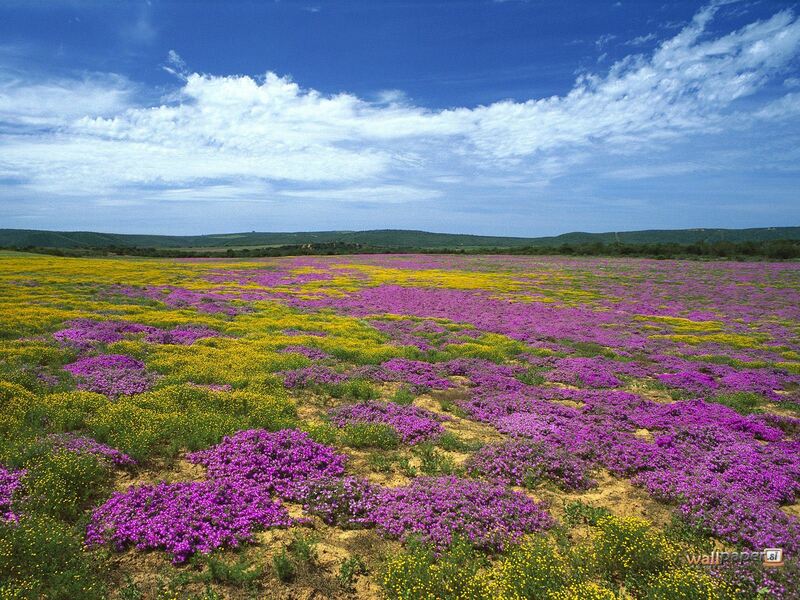 With the arrival of Springtime in February comes the most colourful and festive time at Agra - the Taj Mahotsav. A 10-day long celebrations of Uttar Pardesh's multicultural heritage that becomes major display platform of the arts, crafts, culture, cuisine, folk and classical dance and music of India. Taj Mahotsav is a special event organized by the U.P. Tourism department, keeping the focus as Taj Mahal and held as an annual event at Shilpgram, the neighbouring site of Taj Mahal. This artistic event is a dedication to the legendary skills of master craftsmen and other exponents of art, music and cuisine. Its an opportunity for tourists visiting Taj Mahal to get a glimpse inside the rich heritage and extraordinary legacies of Uttar Pradesh's historic past. The magnificent city of Agra not only offers architectural delights but is also reputed as a shopper's paradise. The city has a number of markets and shopping malls that offers the best of handcrafted item specially the replicas of Taj Mahal that match in every detail of the real building. Agra also offers a variety of leather items including footwear, purses, bags, and decorative items. You can also shop for sandal and rose wood items, brass and stone decorative, embroidered rugs, stone inlay work and floor carvings in the local Handicraft Emporium. There are many shopping area across the city but the major areas include Taj Mahal complex, Kinari Bazaar, Raja Mandi, Sadar Bazaar.